The CCNA is the first exam a candidate takes on the road toward becoming a Cisco certified professional or expert. While Cisco exams are considered very difficult, these exams are also very popular. 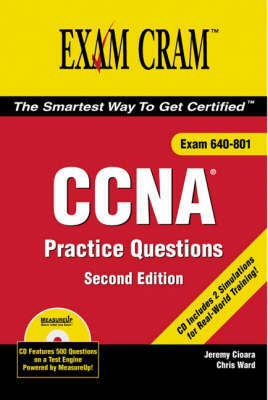 The CCNA Practice Questions Exam Cram 2 will provide you with 500 practice questions and a detailed explanation of correct answers as well as incorrect answers. These questions are provided in print as well as electronic format, complete with a versatile CD-ROM testing engine that provides readiness feedback and simulated test-taking conditions. Special features such as the popular Cram Sheet tearcard are also included to help you better prepare for the exam. Coverage in CCNA Practice Questions Exam Cram 2, Second Edition applies to the 640-801 (INTRO/ICND), 640-821 (INTRO), and the 640-811 (ICND) exams, and is completely updated to match changes from Cisco Systems to these exams since their introduction in 2003.